"LOVE WILL FIND A WAY." "LOVE WILL SAVE THE DAY." Another bully coward is searching for a victim to get his fix for his bullying addiction under the guise of a false accusation. Thanks to the Bully Culture there are a lot more BAD people in this world than there are GOOD people in this world. That being said most victims of bullying are besieged by constant bouts of bullying. This subjects the victim to being Ganged up upon and Gossiped about. Consequently, the Bully Culture blames the victim for being a victim of bullying by claiming that the victim is making trouble for all of these so-called people. By having the “good slam-error-a-ton” also known as the Good Samaritan who is a bully coward incognito accuse the victim of bothering people by saying, "You do not get along with people." Victims just say back,"I get along with GOOD people just fine. It’s BAD people I do not get along with." 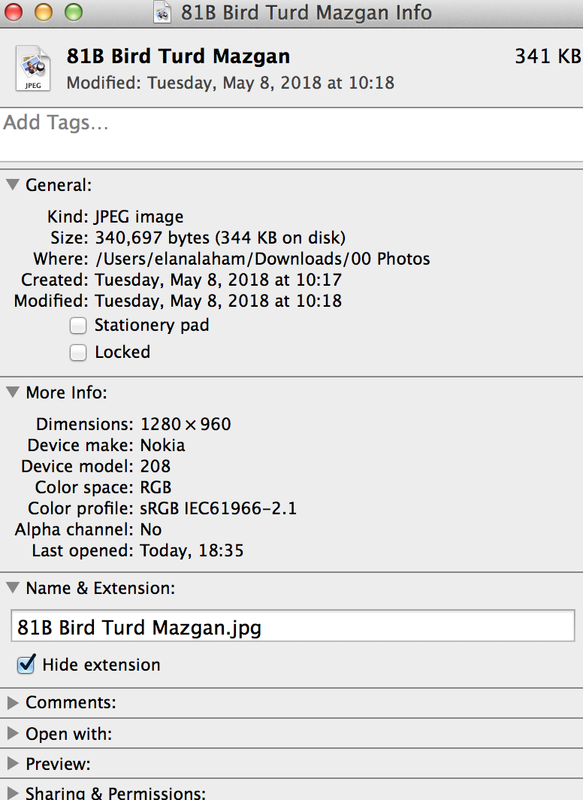 On May 15, 2018, I noticed that the bird noise I had been subjected to for over a year by David Bukrees was no more. The noisy disturbance to the neighborhood bird was gone. It was replaced by a grill. On May 2, 2018, the Court granted me a Protection Order against David Bukrees. So I have reason to believe that fighting back against bully coward David Bukrees led him to removing the bird in order to stop bothering me with its noise. IF YOU FIGHT BACK THEN YOU WILL WIN! On May 2, 2018, at 10:00 a.m., the Supersizing Judge of the Akko Magistrate Courthouse, whose name is Judge Ziad Salach, presided over our Hearing for a petition for a Protection Order against DAVID BUKREES in Courtroom #6. Judge Ziad Salach provided us with an English Interpreter named Ana Ganapol for the Hearing. We arrived at the Hearing a half-hour early at 9:30 a.m.
David Bukrees arrived at the Hearing an hour late at 11:00 a.m.
Then, Judge Ziad Salach informed us, the applicants, that he had already read our written statement along with our artifacts for our petition for a Protection Order against David Bukrees, which we submitted to the courthouse on April 24, 2018. After that, Judge Ziad Salach listened to the respondent, David Bukrees’s, testimony, which Judge Ziad Salach had not ever heard, yet. David Bukrees rambled on and on and on for about ten minutes. We did not know what David Bukrees was saying because it was in Hebrew and since our translator, Ana Ganapol, was not translating his speech for us. The only thing Ana Ganapol translated for us was that David Bukrees was complaining that we cut up paper with a scissors and throw the paper down onto unit #5’s Mazgan. I had two photos showing that the wind blew these papers onto unit #5’s Mazgan. We did not throw them onto unit #5’s Mazgan. The first photo shows a few pieces of paper on unit #5’s Mazgan along with a small pile of these same pieces of paper on the ground on the Garden below signifying that the wind carries the papers from the Garden onto unit #5's Mazgan. 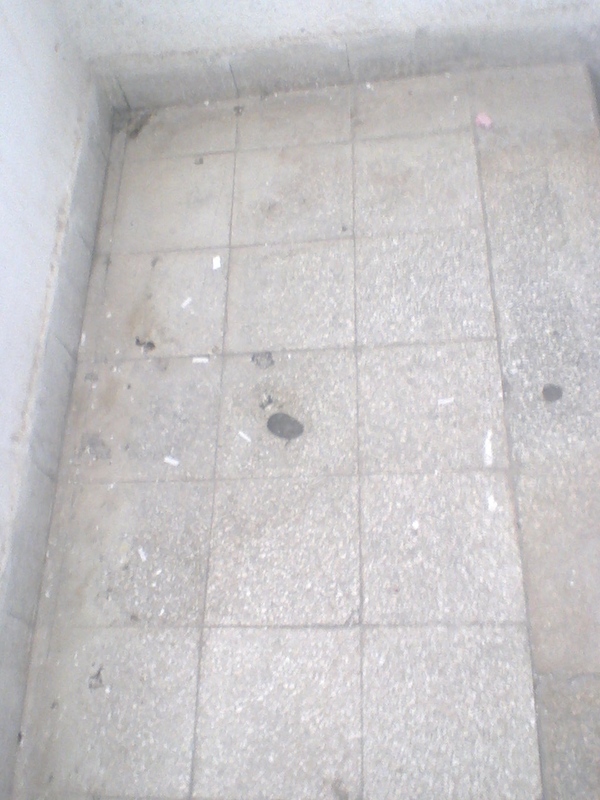 The second photo shows these same pieces of paper on the floor of the Landing between units #7 & #8 and units #9 & #10 indicating that the wind also carries the papers from the Garden onto this Landing, which is higher than unit #5's Mazgan. I had brought these photos with me to present at the Hearing. They were part of the artifacts along with our written statement for our petition for a Protection Order against David Bukrees, which we submitted to the courthouse on April 24, 2018, that Judge Ziad Salach informed us he had read, already. Then, I heard David Bukrees’s drivel that we, my husband and I, are “Not normal”. Our translator, Ana Ganapol did not translate this for us. But I recognized these Hebrew words because they originate from English. Flabbergasted, I said back to litigant David Bukrees in the little bit of Hebrew that I know, “Mah Piton!” which in English means “Really?” stated with sarcasm. David Bukrees physically endangered our lives six times for over a year over a few pieces of paper that the wind blew onto unit #5’s Mazgan. And we are the “Not normal” ones?! After that, my astonishment grew even deeper when I heard David Bukrees’s drivel that we also throw feces onto unit #5’s Mazgan. Our translator, Ana Ganapol, did not translate this for us, either. However, I recognized the word “Kaka”, which is the Hebrew word for excrement. 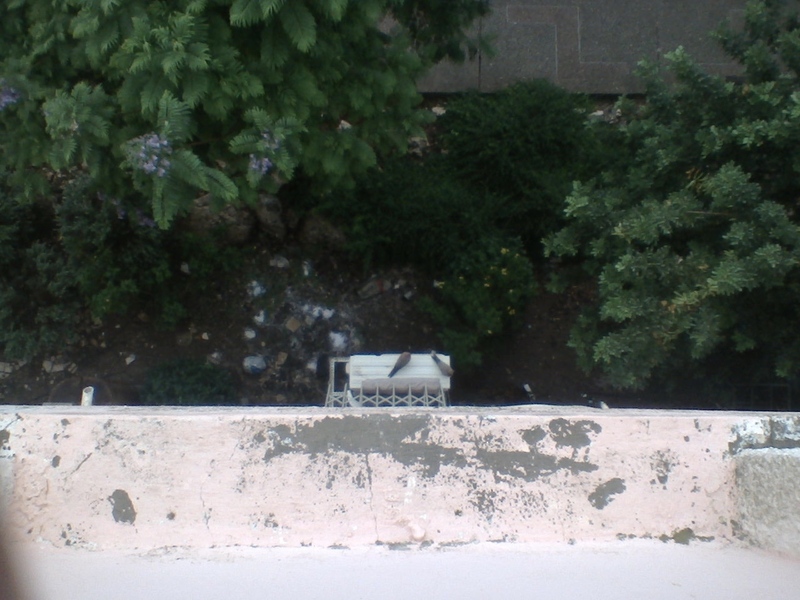 The following are photos showing the culprit that is dropping poo-poo onto unit #5’s Mazgan: They are a couple of roosting pigeons. there was more kinda animals than you've ever seen. And they just run around free while the world was being born. And loveliest of them all was the unicorn. humpty bumpy camels and some chimpanzees. There was cats and rats and elephants but sure as you're born. But the Lord seen some sinning and it caused him a pain. He said, stand back I'm gonna make it rain. So hey, brother Noah, I'll tell you what to do. Go and build me a floatin' zoo. And you take 'em two alligators and a couple of geese. Two humpty bumpy camels and chimpanzees. Cats and rats and elephants but sure as you're born. Noah, don't forget my unicorn. Now Noah, was there and he answered the callin'. And he finished up the ark as the rain started fallin'. Then he marched in the animals two by two. And sung out as they went through. Hey Lord, I got your two alligators and a couple of geese. Lord, I just don't see your unicorn. Well, Noah looked out through the drivin' rain. But the unicorns were hidin' playing silly games. They were kickin' and a splashin' in the early morn. Then the ducks started duckin' and the snakes started snakin'. And the elephants started elephantin' and the boat started shakin'. The mice started sqeekin' and the lions started roarin'. And everyone's aboard but the unicorns. I mean a green alligators and long neck geese. The humpty bumpy camels and chimpanzees. Noah cried, close the door 'cause the rain is a pourin'. And we just can't wait for them unicorns. And then the ark started movin' and it drifted with the tide. And the unicorns looked up from the rock and cried. And the water came up and sorta floated them away. And that's why you've never seen a unicorn to this day. You'll see lots of alligators and long neck geese. You'll see humpty bumpy camels and chimpanzees. You'll see cats and rats and elephants but sure as you're born. All finally went silent in the courtroom. The Hearing abruptly finished but our translator, Ana Ganapol, did not translate what was going on. She did not announce the oral verdict or present to us the written verdict. I had issues with Ana Ganapol not doing her job when she acted as translator during my Hearing with Judge William Hamed for the mutual protection order I have against Susana Vexler as well. I had to approach Judge William Hamed’s bench and in my rudimentary Hebrew request of him that the court make it mandatory for Susana Vexler to keep her trash on her side of the hallway that her and my apartment units share because translator, Ana Ganapol, refused to. If I ever have to go to court again I will request a different translator. It was not until after we did translator, Ana Ganapol’s, job and translated the Hebrew to English using Google Chrome that we discovered that Judge Ziad Salach did his job. Judge Ziad Salach granted us a one-way Protection Order against David Bukrees. Judge Ziad Salach included instructions in the verdict for David Bukrees to go to the Police Department, City Hall, or the Court House if he has any complaint against us. Thank you Judge Ziad Salach for instructing David Bukrees on how to behave in society. If the reader is interested in viewing Judge Ziad Salachs verdict in Hebrew then please go to the following hyperlink 74A at www.bullcrapbusters.com. If the reader is interested in viewing Judge Ziad Salachs verdict in English then please go to the following hyperlink 74B at www.bullcrapbusters.com. Bully Cowards believe that violence will get them what they want or need. So they do not bother to develop any communication skills. David Bukrees did not bother to COMMUNICATE with us like a civilized human being. Instead David Bukrees used VIOLENCE against us like a beast. Problem – we had a language barrier between us. Solution – get a Translator to talk to us or go speak to the Police about us. David Bukrees did not give us the opportunity to explain to him that the WIND BLOWS the papers from the Garden onto unit #5’s Mazgan. We do NOT throw the papers onto unit #5’s Mazgan. Bully cowards have NO rational explanations as to why they behave VIOLENTLY. So they resort to EMOTIONALISM – irrational ranting and raving. David Bukrees presented no evidence to support his false accusations against us. No photos, no witnesses, no fingerprints, etc. David Bukrees called us names and insulted us, instead. 1) David Bukrees states to the Judge, "I do not know how I managed to threaten them when I did not speak English." Yet he also states to the Judge, "I ask why they do it and they do not answer me." David Bukrees has contradicted himself, also known as not being able to keep his lies straight. On the one hand he declares he does not speak English. So how can he threaten us. On the other hand he declares that we do not answer his question. So how can we reply to his inquiry when he does not speak English? Anyway, his threats were spoken via body language. 2) David Bukrees states to the Judge,"They have a habit of sitting for hours and cutting paper, they cut paper and throw out the window, they throw feces from the window. They eat and throw leftovers from the window." First of all, is David Bukrees Superman who has x-ray vision that can see into the walls of my apartment and watch my spouse and I cutting up papers and for hours? Second of all, where is David Bukrees's proof that he or any one else witnessed my spouse and I throwing paper and feces and food from a window? 3) David Bukrees states to the Judge, "I live 2 stories below, on my air conditioner I always find leftover food, junk and feces." 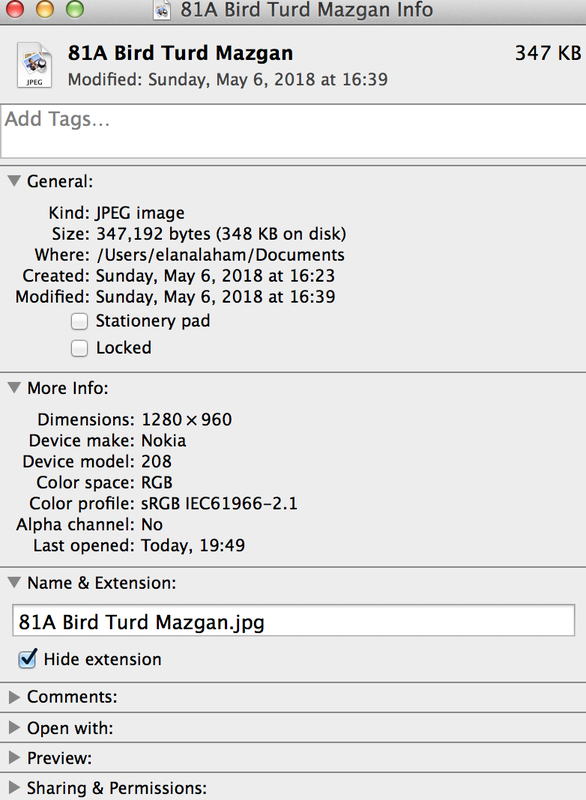 As I already stated above along with my photo proof the birds are leaving the poo-poo on unit #5's Mazgan. As I already stated below I was not able to get any photo proof of the always find leftover food on unit #5's Mazgan. 4) David Bukrees states to the Judge,"I have permits from the municipality that I came with a supervisor several times..."
If this is so then why didn't David Bukrees present these permits as evidence to the Court? ​ 5) David Bukrees states to the Judge,"... and they do not open the door." Again...is David Bukrees Superman who has enhanced hearing that can listen thru the door of my apartment to know if my spouse and I are in my home or not? 6) David Bukrees states to the Judge, "I do not know whether they are normal or not." and "The warden (of City Hall) said there was something medical (regarding us)." David Bukrees has discredited himself. For neither David Bukrees nor the Warden are in any position to make such a statement as they are not medical experts. If the reader is interested in viewing the Court's Minutes in Hebrew and English then please go to hyperlink 84 at www.bullcrapbusters.com. We noticed that Judge Ziad Salach did not stipulate in his verdict the Duration of the Protection Order that he granted us against David Bukrees. The police cannot enforce a Protection Order if they do not know for how long it is Valid for. So on May 6, 2018, we sent a fax to Judge Ziad Salach alerting him of this. On May 7, 2018, Judge Ziad Salach sent us a reply granting us a six month Protection Order against David Bukrees, which is as long as the law allows. If the reader is interested in viewing the Law of Harassment document (see Section 6 entitled “Period of Validity”) then please go to hyperlink ZZZ at www.bullcrapbusters.com. We noticed that Judge Ziad Salach did not include in his verdict instructions regarding delivery of the court documents pertaining to the Protection Order against David Bukrees to the police. The police cannot enforce a Protection Order if they do not know that it Exists. So on May 17, 2018 we sent a fax to Judge Ziad Salach alerting him of this. On May 17, 2018, Judge Ziad Salach sent us a reply authorising us to deliver the Protection Order against David Bukrees to the police. We are requesting an English Interpreter at the Akko Courthouse for a Hearing that Judge Ziad Salach will be presiding over on May 2, 2018 @ 10:00 a.m., regarding our petition for a Protection Order for Case #44415-04-18. Following this fax are the two verdicts of Judge William Hamed who issued us two English Interpreters for the two Hearings for a Protection Order for Case #13488-04-17. Also following this fax is my UPDATED web page “Updates 4/1/18”. Or you can go to (URL) www.bullcrapbusters.com web site and click on (html) “Updates 4/1/18” web page. From Elana Laham and Michael Laham"
If the reader is interested in viewing the fax I sent to Head Judge Ziad Salach then please go to hyperlink 71 at www.bullcrapbusters.com. We are requesting permission to submit the following evidence attached to this fax for Case #44415-04-18 of which, we are the petitioners. The evidence pertains to our petition for a Protection Order against David Bukrees. On April 24, 2018, we submitted this evidence to the Akko Magistrate Courthouse. However, the General Services Office Manager named Dorit informed us that your scanning machine does not copy photos in color. She showed us the black and white images that your scanning machine made of these photos, and they are not clear. Papers Mazgan 66A along with Date photo 66A. Papers Stairwell 66B along with Date photo 66B. Note Bird 64C along with Date photo 64C. Note Bird 64D along with Date photo 64D. 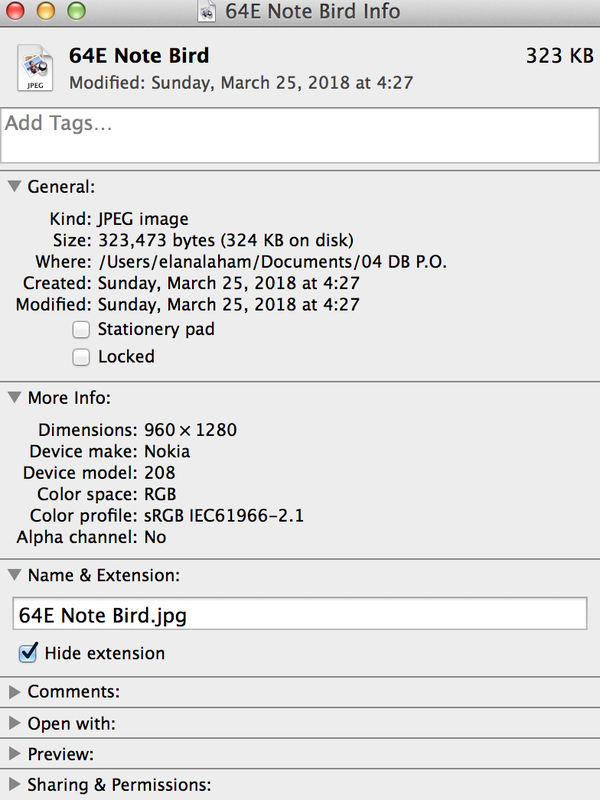 Note Bird 64E along with Date photo 64E. Bird Noise 64F along with Date photo 64F. 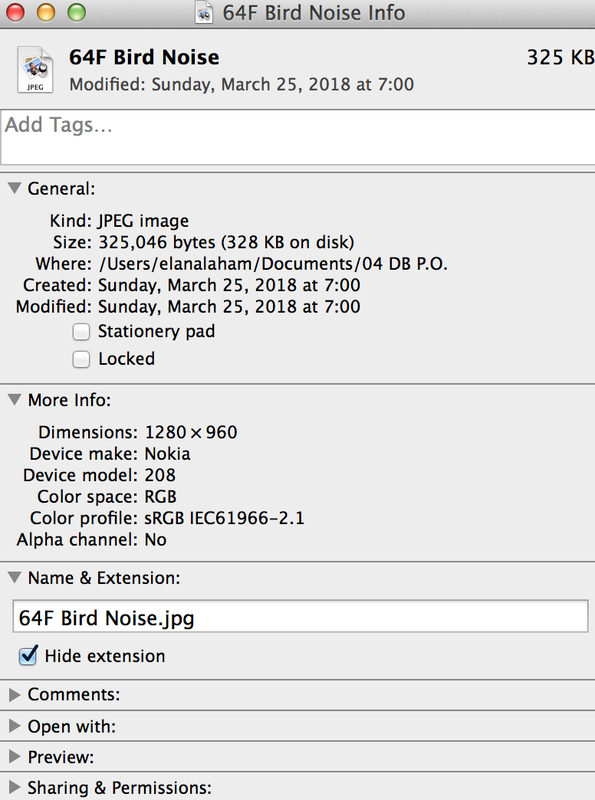 Bird Noise 64G along with Date photo 64G. My Doorbell Ring 65A along with Date photo 65A. 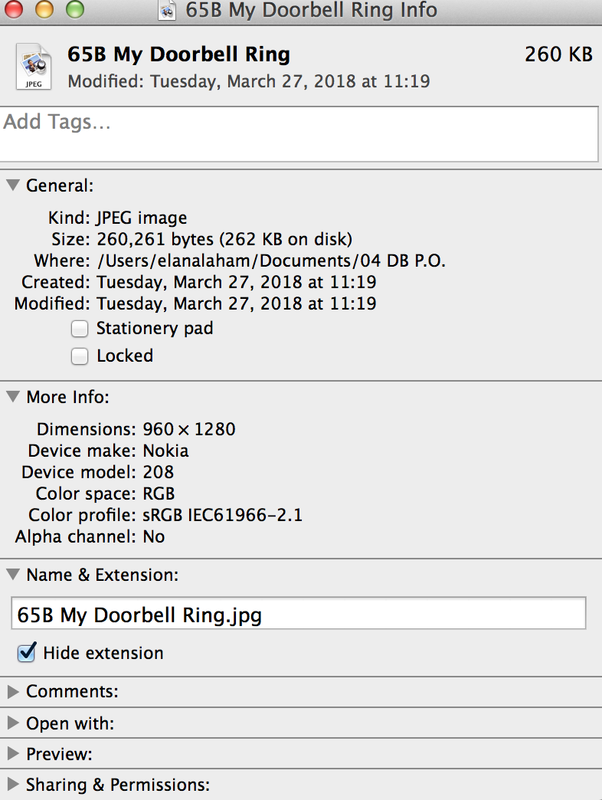 My Doorbell Ring 65B along with Date photo 65B. 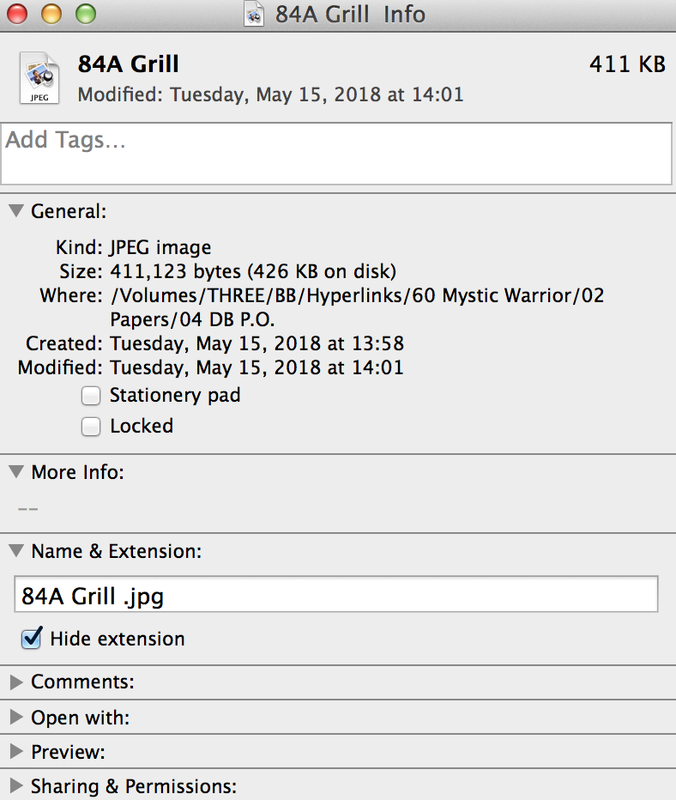 If the reader is interested in viewing the fax I sent to Head Judge Ziad Salach then please go to hyperlink 72 at www.bullcrapbusters.com. I am sending this correspondence to you to bring to your attention Police Report #141957, which is a complaint about a violent male, whose name is David Bukrees, who has committed assault and battery against my husband and who has been physically threatening my husband and I for over a year. We will be filing a petition for a Protection Order against David Bukrees at your Akko Magistrate Courthouse. I, Elana Laham, am posting the events as they develop regarding whether or not your court will grant us a Protection Order against David Bukrees including the details of what has transpired that has lead us to decide that we must take this legal action against David Bukrees on my web page “Updates 4/1/18” on my web site www.bullcrapbusters.com, for the entire Internet world to know about. Included in this fax is my web page “Updates 4/1/18”. Or you can go to (URL) www.bullcrapbusters.com web site and click on (html) “Updates 4/1/18” web page. Included in this fax are the Google, Yahoo, and Bing search engine web pages. I have also included in this fax a copy of the Police Report #141957. 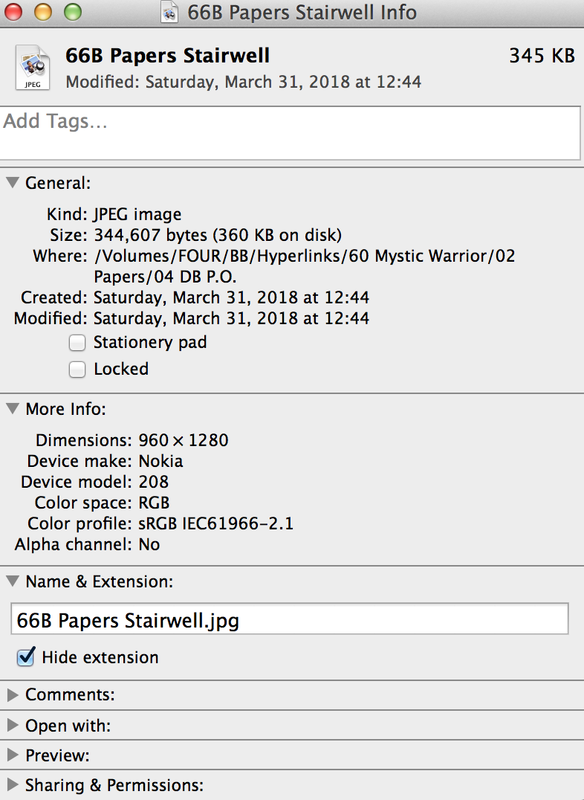 If the reader is interested in viewing the fax I sent to Head Judge Ziad Salach then please go to hyperlink 70 at www.bullcrapbusters.com. We are petitioning for a Protection Order against a violent crazy neighbor (we do not know who does not know us) whose name is DAVID BUKREES for repeatedly committing Assault and Battery, Physical Threats, and Harassment upon us. A) Harassment for the Sake of Harassment: We Not He Contacted the Police. B) Extensive Harassment: Both Husband and I. C) Continual Harassment: Six Incidents of Harassment over a One-Year period. Michael Laham and Elana Laham were going up the stairwell to Elana Laham’s apartment unit #9 when a male we did not know blocked our path. 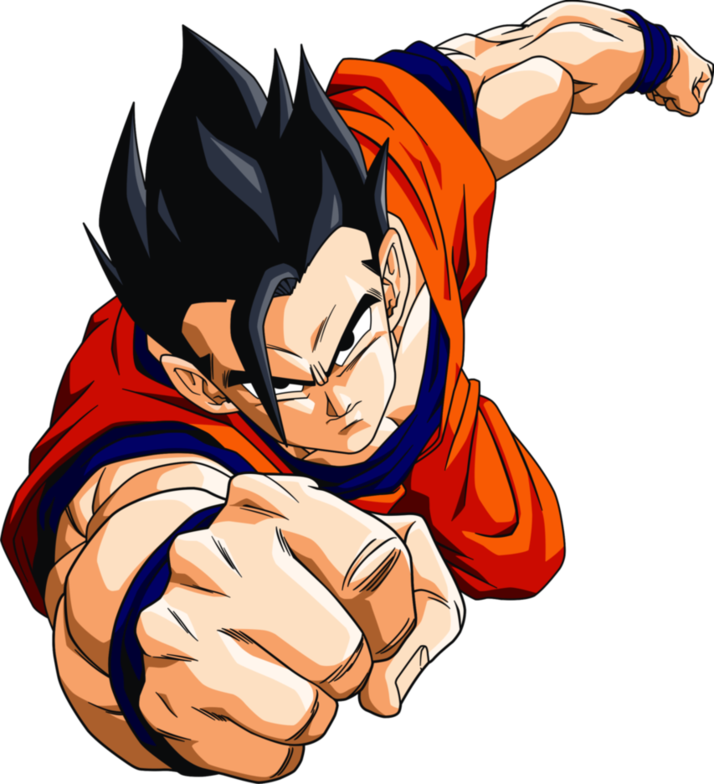 The male was about six and a half feet tall, he had black short hair with a black stubble beard, and olive skin color, a medium build, and he looked to be in his mid twenties in age. We tried to go around him but he got into a military stance (feet shoulder width apart and arms crossed over his chest), which made it necessary for us to make contact with his body if we continued to go up the stairs. Elana asked him why he was blocking our way. He said something in Hebrew we did not understand. So Elana asked him if he spoke English. He said the following two words in English to us: “food” and “fell”. We did not understand what he was saying. So Elana told him if he did not get out of our way we were going to contact the police. He refused to let us pass him. So Elana asked him for his name and his address. He told us that his name was Mazubee and that he lived in apartment unit #5. We invited him to go to the police with us. He refused. 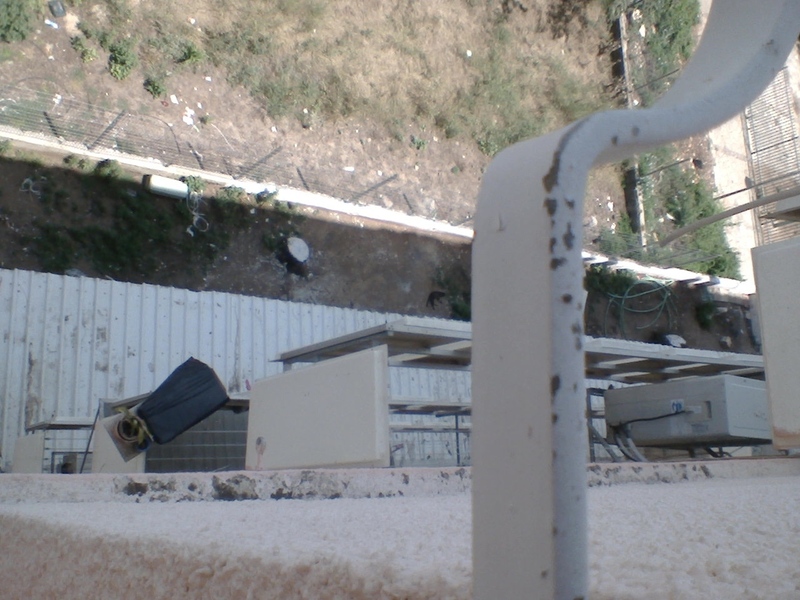 So we turned around, descended down the stairwell, went to the local Karmiel Police Station, and reported to the police what had happened. The police did not know who the male was. So they told us we cannot file a police report. Then, two police officers escorted us home. The male was gone. 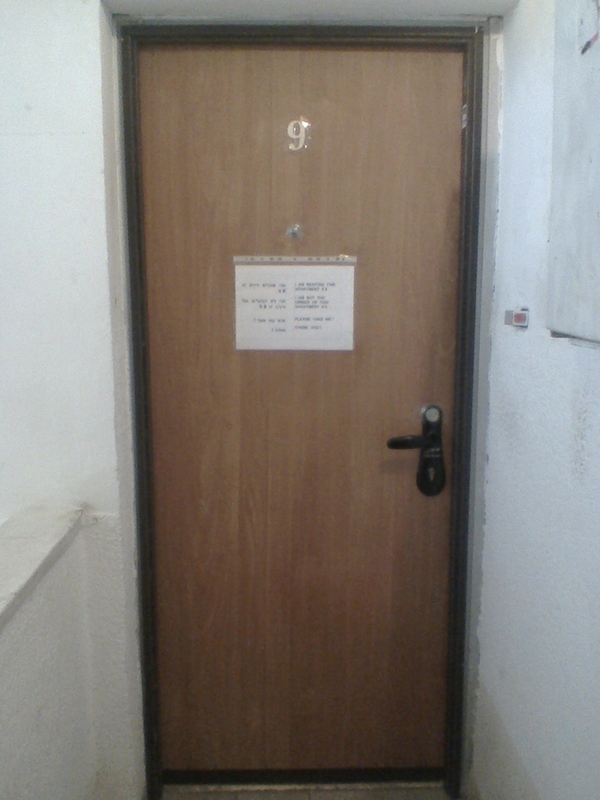 After that, the police officer, whose name is Uri Lav Ari, knocked on apartment unit #5’s door. No one opened the door. So the police officers left. I, Michael Laham, was going to my wife, Elana Laham’s, apartment when the same male who harassed my wife and I, blocked my path. I tried to go around the male but the male got into a military stance (feet shoulder width apart and arms crossed over his chest), which made it necessary for me to make contact with his body if I continued to go up the stairs. The male said the following two words to me in English: “food” and “fell”. I did not understand what he was saying. 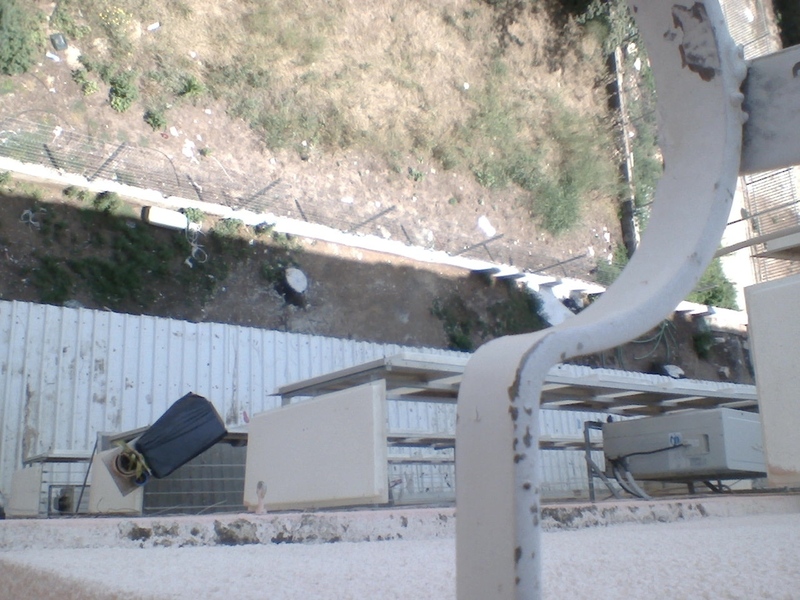 So I turned around and descended down the stairwell, went to the local Karmiel Police Station, and reported what happened. I spoke to an officer named Faiz who escorted me to Elana Laham’s apartment. I told officer Faiz that this male told us that his name was Mazubee and that he lives in apartment unit #5. Officer Faiz went to apartment unit #5 and spoke to a middle-aged female in a language I do not know. 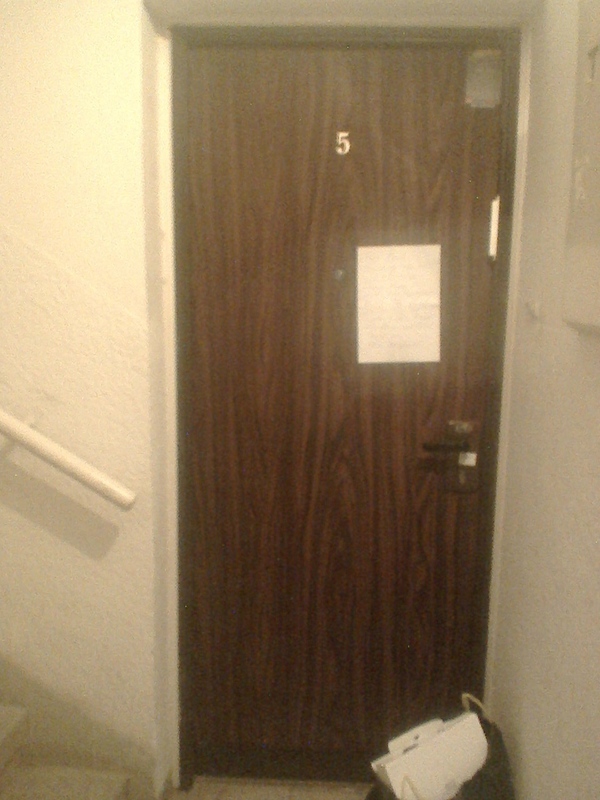 Then, Officer Faiz reported to me that the female informed him that no male lives in apartment unit #5. After that, Officer Faiz told me that the police are not able to file a police report without knowing the male’s name and the male’s residence. I, Michael Laham, was going to my wife, Elana Laham’s, apartment when the same male, who harassed my wife and I, blocked my path at the landing for apartment units # 5 and #6. I tried to go around him but he got into a military stance, (feet shoulder width apart and arms crossed over his chest), which made it necessary for me to make contact with his body if I continued to go up the stairs. He said the following words to me in English: “Food on mazgan. Come in. I show you.” The door to apartment unit #5 was open. I refused to enter the apartment unit #5 for fear of my safety. Suddenly, the male committed assault and battery against me by throwing parsley in my face. I quickly left. I, Michael Laham, was walking northbound on Rehov HaGalil to the store to buy groceries when the same male, who committed assault and battery against me and harassed my wife and I, was now stalking me by driving up to me on a motor scooter and said the following words to me in English: “Food on mazgan”. This part of Rehov HaGalil is a one-way street. So for fear of my safety I quickly walked away in the opposite direction of his motor vehicle. Then, he drove away. I, Michael Laham, was walking northbound on Rehov HaGalil from the library to my apartment when the same male, who committed assault and battery against me and harassed my wife and I, was now stalking me by driving up to me on a motor scooter and said the following words to me in English: “Food on mazgan”. This part of Rehov HaGalil is a one-way street. So for fear of my safety I started to turn around to walk away in the opposite direction of his motor vehicle. When he drove away. As he was driving away, I got the license number of his motor scooter. For about a year now, I, Elana Laham, noticed that the neighbors in apartment unit #5 have been leaving a bird in a birdcage on their balcony both day and night, rainstorm or sunshine, which constantly makes noise. About three months ago, I noticed that both the bird and the birdcage were gone. There was no more bird noise. 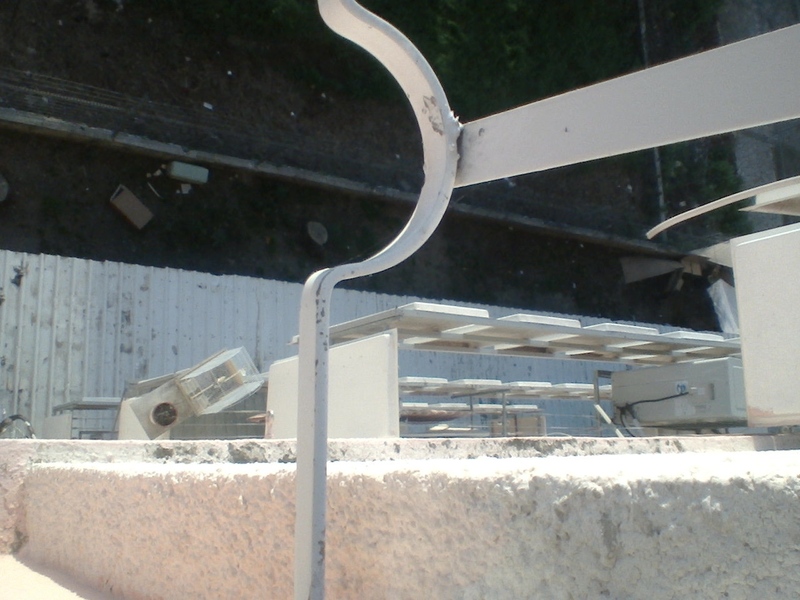 About a week ago, I heard bird noise again and noticed a bird in a birdcage on the balcony of the neighbors in apartment unit #5. Obviously, these photos cannot disclose the noise that this bird is making. 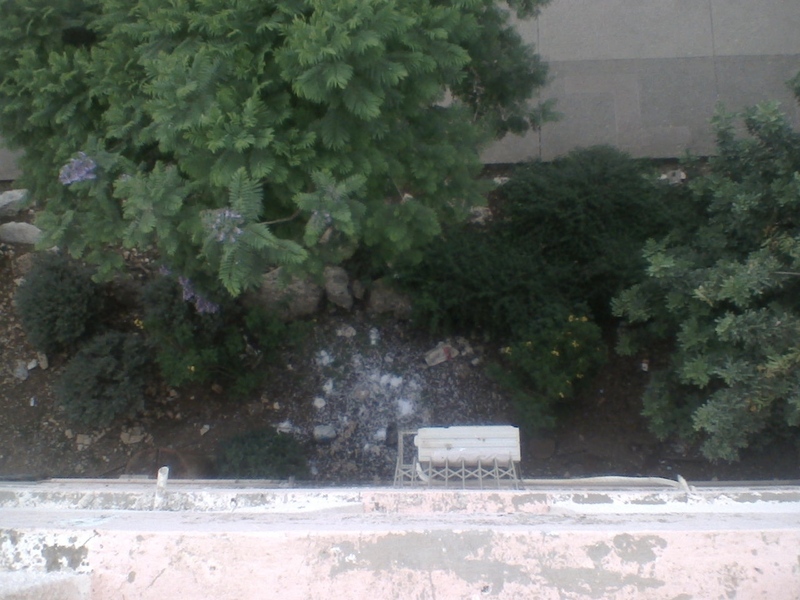 But these pictures do display the presence of a bird on apartment unit #5's patio. I do not know why these people bought a bird not for the enjoyment of it being inside their own home, but just to leave it outside where all the neighbors have to hear it. That afternoon, I, Elana Laham, heard a noise in the hallway in front of my apartment door. I looked thru my apartment door’s peephole and noticed it was the same male who committed assault and battery against my husband, stalked my husband, and harassed my husband and I. He put a ladder down in front of my apartment door and started climbing up the ladder to the roof. I was wondering what he was doing there, as he had no tools with him to fix anything. I tried to take a photo of him with my cell phone thru my peephole but there was too much light flooding the hallway to be able to take any picture. I called my husband and told him I was concerned that this male might bother me in some way. My husband told me later that while he was going up the stairwell to my apartment the same male who committed assault and battery against my husband, stalked my husband, and harassed my husband and I, was blocking my husband’s path. Then, the same male demanded to know, “What do you want with bird?” My husband said, “As we said in our note to the neighbors in apartment unit #5, we need the bird to stop making noise”. [A female resident of apartment unit #5 had told police officer Faiz that this same male does not live in apartment unit #5! 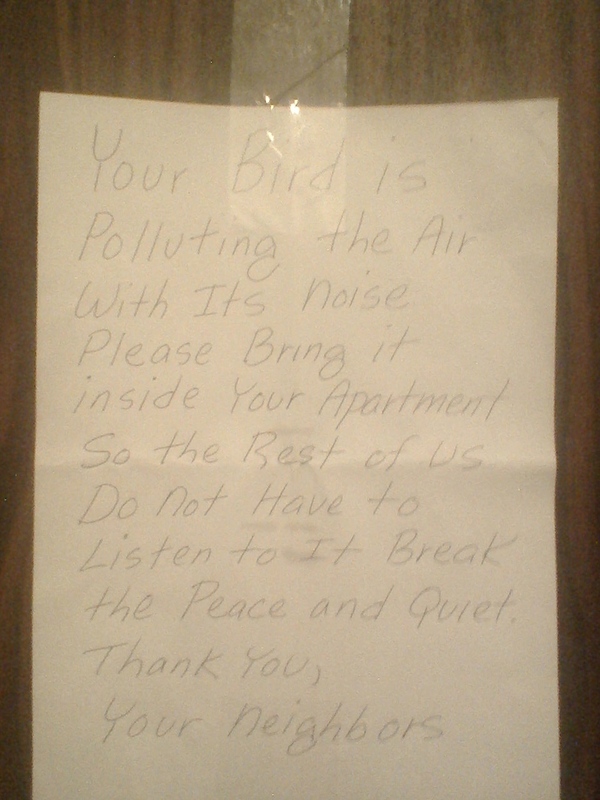 So why was this same male bothering us about our concern with the bird in apartment unit #5?] After that, my husband turned around and went down the stairwell. But instead of leaving my husband alone, this same male stalked my husband by following my husband down the stairs. So my husband went into the street where there were people and at around 4:00 p.m. my husband called the emergency police (telephone number 100). Next, I saw this same male running very fast up the stairs to my apartment. Fearing for my safety I ran from the hallway into my apartment and closed and locked my apartment door. I saw this same male thru my peephole and heard him violently hit and kick my apartment door repeatedly. I tried to take a photo of him with my cell phone thru my peephole but there was too much light flooding the hallway to be able to take any picture. So I told him thru my peephole, “We know who you are and we have called the police.” Now I saw this same male thru my peephole turn his head sideways so that his head was facing the hallway wall. Then, I heard my doorbell start ringing. It continuously rang non-stop, as if somebody was holding his finger on the doorbell. Now I saw this same male thru my peephole leave. After that, while my doorbell was still ringing, I quickly unlocked and opened my apartment door. I saw a piece of twig jammed in my doorbell switch. I took the piece of twig out of my doorbell switch. My doorbell stopped ringing and I quickly closed and locked my apartment door. There is no longer a twig in the doorbell. For fear of my safety I did not want to try to take a picture of said twig in doorbell while this crazy violent neighbor was still somewhere in my vicinity. 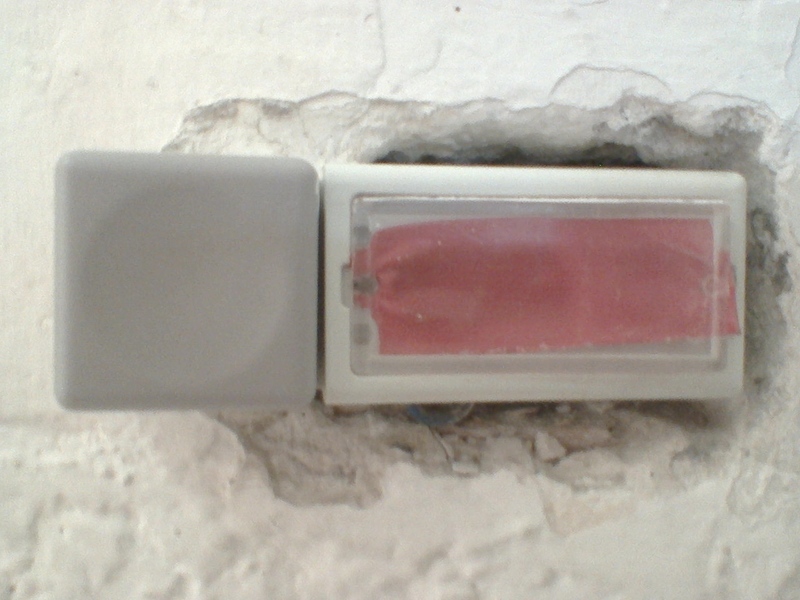 But as you can see there is a gap between the grey portion and the white portion of the doorbell. That gap is where I discovered the twig, which made my doorbell constantly ring. 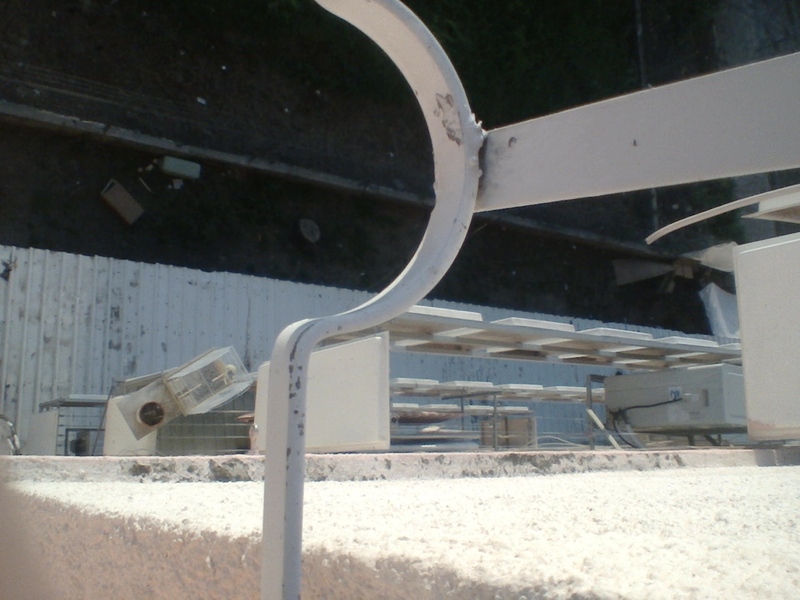 At around 4:30 in the afternoon, the emergency police arrived and escorted my husband to my apartment. Meanwhile, this same male had disappeared. They came with my husband into my apartment and my husband and I told the police what had happened. Then, I told the female officer, whose name was Shanee, the license number of this male’s motor scooter. 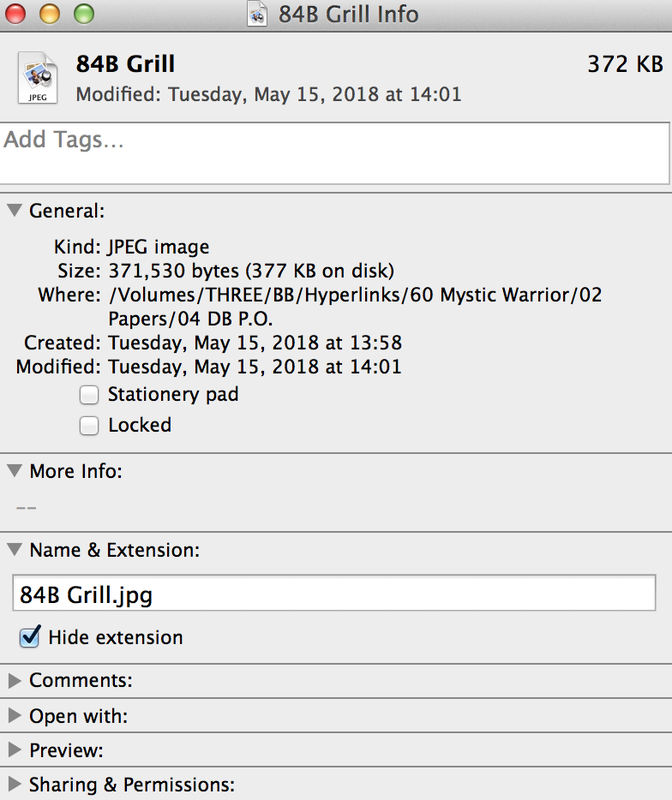 After that, officer Shanee inserted the license number into her computer and it gave her the name and photo of this male. His name is David Bukrees. My husband and I confirmed that this was the male who committed assault and battery against my husband, attempted assault and battery against me, stalked my husband, and who is physically harassing us. The police decided to talk to David Bukrees. 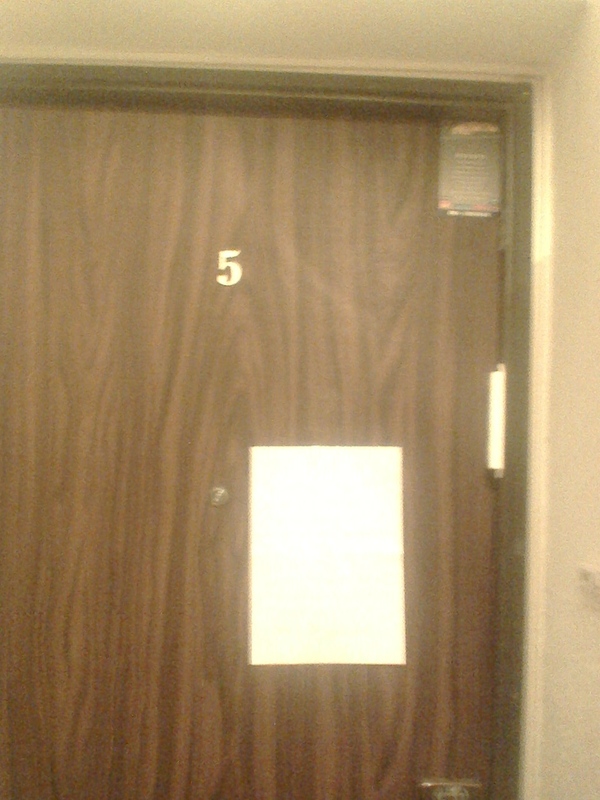 So the police and my husband left my apartment to go to apartment unit #5 to talk to David Bukrees. That was when I heard a noise in the hallway in front of my apartment door. I looked thru my apartment door’s peephole and saw David Bukrees re-appear. As if he was hiding from the police, he was on the roof and his ladder was on the roof with him. The access door of the roof is next to my apartment. David Bukrees with his ladder jumped down from it onto the hallway floor in front of my apartment. So I called my husband on my cell phone and told him to inform the police where David Bukrees was. My husband brought the police back to my apartment and they talked to David Bukrees in the hallway. Then, the male police officer, named Roslan, mentioned something to us about papers. We did not know what he was talking about. So we told him so. After that, officer Roslan told us to go to the Karmiel police station to file a Police Report and a Protection Order against David Bukrees. So we did. Luckily, my apartment door was undamaged. So we do not have to file a lawsuit against David Bukrees. On March 28, 2018, we filed the above police report with the Karmiel Police Station against David Bukrees. If the reader is interested in viewing the Police Report # 141957 that we filed against David Bukrees in Hebrew then please go to hyperlink 67C at www.bullcrapbusters.com. If the reader is interested in viewing the Victims' Statement included in Police Report # 141957 that we filed against David Bukrees in Hebrew and English then please go to hyperlink 67D at www.bullcrapbusters.com. Due to the language barrier, it took us a while to know what police officer Roslan meant when said to us in English the one word, “papers” and what David Bukrees meant when he said to us in English the words, “food on mazgan”. We realized that David Bukrees committed assault and battery on my husband, attempted assault and battery on me, was stalking my husband, and physically harassing us for over a year because he was accusing us of (behind door#1) putting food on unit #5’s mazgan, and since he is now accusing us of (behind door #2) putting papers on unit #5’s mazgan. We did not put any food or any papers on unit #5’s mazgan. David Bukrees’s “food on mazgan” accusation occurred April-May, 2017. There was no food on unit #5’s mazgan. So I was not able to take a photo of it. 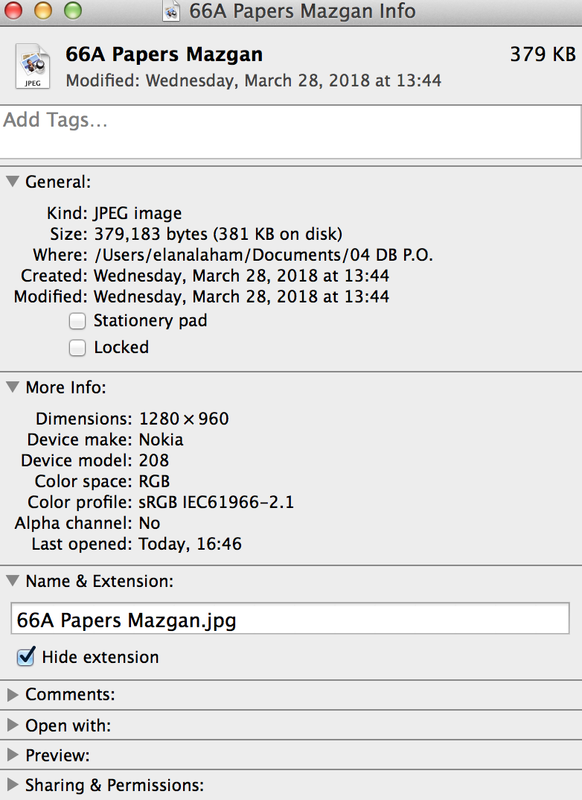 David Bukrees’s “papers on mazgan” accusation occurred March 25, 2018. There were papers on unit #5’s mazgan. So I was able to take a photo of it. In the photo there are a few little pieces of paper on unit #5’s mazgan. 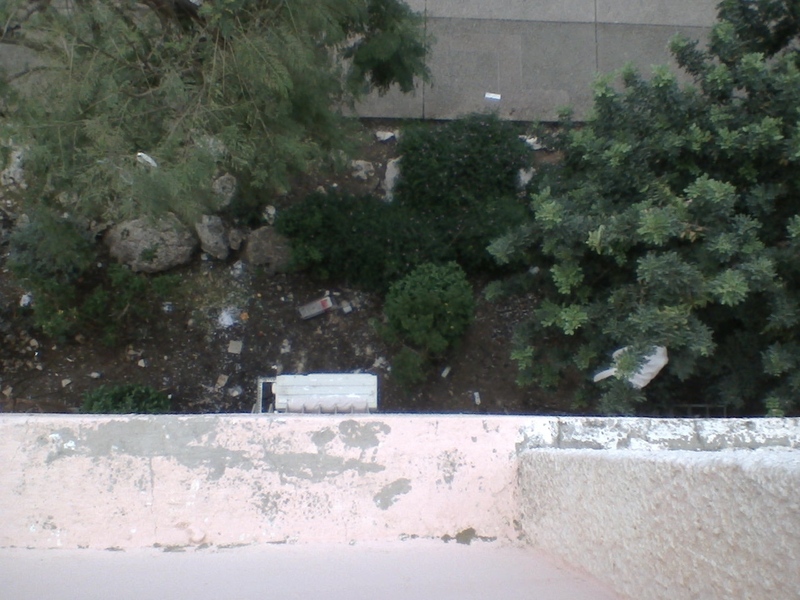 In the photo there are also little pieces of paper on the ground of the garden in front of a tree. I have seen these papers. The wind grabs these papers and blows them all over the place. They land on the sidewalk, plaza, and stairwell of my apartment building. On April 24, 2018, we submitted the Police Report, Victims' Statement, and above Photos along with our Application for a Protection Order against David Bukrees, and Court Receipt of Application for a Protection Order against David Bukrees to the Akko Magistrate Courthouse. [Reader's Note: You are welcome to use my Oral Presentation for Court as a sample for how to prepare an Oral Presentation in Court]. If the reader is interested in viewing my Oral Presentation then please go to hyperlink 75 at www.bullcrapbusters.com. The BullCrap Busters Website will transmit its signals over the Internet for as long as we have not been CENSORED off the web due to the ELITE CYBER BULLY as a result of LIBEL and/or SLANDER, and/or ANTI-MARKETING CAMPAIGNS, and/or BANKRUPT by bought off justice, and/or ARRESTED and/or INCARCERATED by trumped up charges, and/or MURDERED by a staged accident by those who have the audacity to call themselves FRIENDS of humanity, yet who are ENEMIES to us who dare to exercise our HUMAN RIGHTS, namely FREEDOM of SPEECH, in order to assist HUMANITY in overcoming BULLYING.